While CORI reform gains attention as a model national policy, a deeper story accounts for a dogged grassroots coalition that willed these changes into law. Within Massachusetts’ advocacy sector, the CORI reform campaign has long been heralded as an authentic community- based effort where ex-prisoners, those with court records and the chronically unemployed were at the center of the strategy and action. After a decade of protest and six years of legislative campaigning, the CORI reform victory affirms the power and potential of our communities to reshape the policies that structure our lives. Conceived in the early 1970s at the dawn of mass incarceration, the Massachusetts’ CORI database was formed to digitize and share criminal records between law enforcement agencies. Initially, employers and housing authorities were restricted from accessing the sensitive profiles. But by 1982 President Reagan’s War on Drugs swept the nation, multiplying non-violent drug arrests, mobilizing white middle class fear and instigating a growing practice of background checks for employment. As the rise of the “urban threat” permeated the national psyche, new lines were drawn in the American workforce, divided by a criminal record. From the mid 1990s, major employers using background checks grew from 20 percent to over 80 percent today. In his study Mark of a Criminal Record, Devah Pager shows that white non-offenders have a 680 percent advantage over Black applicants with a criminal record. But this disparity is eclipsed by broader revelations that white ex-offenders have a 17 percent advantage over Black applicants without a criminal history. As Civil Rights victories of the late 1960s began to free Blacks to enter the competitive labor market, American industry circumvented the newly empowered workforce through rapid global outsourcing and exclusion from work. Between 1969 and 1978, new economic policies dramatically expanded margins of unemployment between Black and white men from only 1.4 percent to over 18 percent. While corporations concentrated record profits, a new service economy increasingly exploited women of color and vulnerable immigrants while producing an unprecedented surplus of underutilized Black men in the workforce. Today Boston’s young African-American men live in crisis with unemployment rates of over 40 percent. At the same time, one in three young Black men remain under some form of criminal supervision. Absent of genuine alternatives, underground economies have been left to ferment while a parallel War on Drugs targets the same population of structurally unemployed young men. Modern CORI discrimination obscures a highly segregated economy by making criminal record status an effective proxy for race. Joblessness is attributed to acts of crime and irresponsibility, while sustaining an economic system that destines young men of color to unemployment before any contact with the criminal justice system. In many ways, CORI reform only intervenes at the end of a vicious cycle; it does not reshape the economy nor uproot racism in hiring. But reforms are nonetheless critical for absorbing the urban devastation generated at the intersection of post-industrial capitalism and the prison industrial complex. As former offenders often testify of their own journeys in transformation, what appears a bitter ending can reveal itself as a point for new beginnings. The campaign to reform CORI began over a decade ago through the work of ex-prisoners organization the Stanley Jones Clean Slate Project and progressive legal think tank the Massachusetts Law Reform Institute. Beginning in the late 1990s, these groups began to document the nature and impact of CORI discrimination while creating guides for advocates to understand opaque CORI laws. In 2001, radical Boston City Councilor Chuck Turner and four activists from the American Friends Service Committee occupied the Department of Public Health building, protesting new regulations that permanently banned most ex-offenders from working in health and human service agencies. The civil disobedience helped propel the issue of CORI into the political arena. From 2004 to 2005, three key organizations formed to help launch a statewide movement to reverse draconian CORI laws. The Massachusetts Alliance to Reform CORI (MARC) was founded by the Union of Minority Neighborhoods as a statewide coalition to popularize CORI reform and win new local and state policies. Working with City Councilor Chuck Turner, MARC helped pass Boston's first CORI Reform Ordinance in 2004, a landmark municipal law including prohibiting employers from asking about criminal history on job applications." In the same period, two key base building organizations were gaining momentum in Massachusetts’ two largest cities, Boston and Worcester. Ex-prisoners and Prisoners Organizing for Community Advancement (EPOCA) took root in 2004 as a new initiative in Worcester to organize a multi-racial group of ex-prisoners with strong roots in the recovery community. 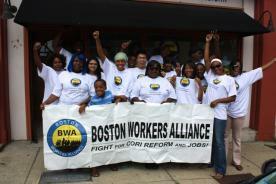 In 2005, the Boston Workers Alliance (BWA) was founded as a grassroots union of under- and unemployed residents based in Boston’s predominantly African- American neighborhoods. Both organizations quickly developed as credible political forces, led by boards of directors who suffered from CORI discrimination in their own lives. As early coalition members, EPOCA and BWA leaders discussed the complexities of CORI discrimination and helped outline solutions to create the first comprehensive CORI reform bill, the “Public Safety Act.” Despite growing attention to the issue, the Public Safety Act was left without action between 2005 and 2006, deferring changes until after the election of a new Governor. As Governor Mitt Romney left Massachusetts politics to pursue presidential aspirations, the gubernatorial race became a key point of leverage for the CORI reform movement. The Democratic primary was a three-way contest including little known candidate Deval Patrick. Patrick was a high-level corporate lawyer and former US Civil Rights attorney who entered the race as the state’s first African American candidate for Governor. Struggling to appeal to his potential demographic base, community activists pushed Patrick to endorse CORI reform. Adopting CORI as a central issue in his urban campaigning, Patrick energized a traditionally overlooked voter base in low-income communities across the Commonwealth. With record voter turnout, Patrick won the Democratic nomination and handily defeated the Republican candidate for the executive office. With the first Democratic Governor since 1990, the coalition escalated activities to seize the opportunity for reforms. In April of 2007, the Boston Workers’ Alliance organized the pivotal “March for Jobs and CORI Reform,” a three mile mobilization from inner-city Boston to the State House. The march involved 50 organizations and over two thousand participants in the largest demonstration of exprisoners and allies in recent state history. In 2008, EPOCA further intensified public pressure by staging a 50-mile, five-day walk from Worcester to Beacon Hill to raise awareness in cities and towns across the Commonwealth. Despite broad-based actions and public support from the Governor, CORI seemed log-jammed in the House Judiciar y Committee due to its seemingly controversial nature. But in the last week of the 2007-08 session, the House Judiciary Committee released a CORI bill for a potential vote, meeting a highly elusive milestone for the campaign. The bill included several key demands, but also provided for a highly regressive expansion of parole supervision that was counter to the goals of the coalition. While some political leaders encouraged our coalition to embrace the opportunity, hard deliberations within respective member-based groups led to a principled withdrawal of support for the bill. Driven by a desire for real freedom over symbolic victories, the strategic decision by ex-prisoners to forgo the bill was significant and essential to our ultimate successes. Radicalized by the legislative roadblocks, coalition leaders refocused political attention to the Governor who had campaigned on CORI but had yet to deliver changes. Running public street theater and a statewide call-in campaign, the initially resistant administration was moved to invite leaders to the table to craft an Executive Order on CORI. Signed in December of 2008, the Governor banned the box for all public jobs applications, and reversed the punitive health and human service policies protested by Councilor Turner and other activists over eight years before. Gaining momentum from the notable victory, grassroots leaders entered the 2009-2010 legislative session with renewed determination. The coalition’s legislative support in Boston and Worcester was near unanimous, but was limited in suburbs and smaller cities due to lack of organizational bases. Working to extend the geographic reach needed for majorities in both chambers, the coalition regrouped under a new banner of the Commonwealth CORI Coalition and increased statewide membership to over 120 community, youth, faith, service and labor organizations. Through this process, statewide Latino basebuilding organization Neighbor to Neighbor joined the coalition, bringing new constituent power in half a dozen smaller immigrant heavy cities. The last two years of the campaign were marked by persistent grassroots presence in the State House, large public demonstrations and increasingly vocal endorsements of new stakeholders. In the 12 months before the July 31, 2010 legislative deadline, the CORI coalition held over 11 major rallies and lobby days, bringing hundreds of voters to the capitol on each occasion and generating thousands of letters and phone calls from across the state. A growing team of progressive lobbyists augmented the coalition’s capacity, helping to secure over 80 House co-sponsors in a body of only 160 members. In July 2009, a broad coalition of youth groups raised the mantle for CORI reform with over 500 marchers in a youth led action to the State House. In February of 2010, an alliance of Black ministers launched a 40-day fast for CORI reform during lent. By June of 2010, coalition leaders secured key law enforcement endorsements from both the statewide police chiefs and sheriffs’ associations. Faced with high recidivism rates, prison overcrowding and spiraling costs of incarceration, law enforcement leaders lauded CORI reforms as a “smart on crime” antidote after years of “tough on crime” posturing. Despite the broad based support for CORI reform, the final votes of enactment were dramatically prolonged until 11pm on the final night of the formal session. After an exhausting month of escalated grassroots pressure, dozens of leaders watched from the House balcony as CORI passed in a historic vote of 139-17. Trembling with relief, grassroots leaders poured into the marble hallways of the capital with cries of joy and renewed promise. On the morning of August 6, 2010 over 300 people filled a small auditorium for the Governor’s signing ceremony of historic CORI reforms. For the grassroots leaders who suffered from CORI discrimination, the spirited event was a vindicating moment after years of struggle in an often dismissive and adversarial climate. In an astounding show of consensus amongst the political elite, top elected officials, law enforcement leaders and business owners flanked the Governor for the momentous celebration. Primary reforms in the bill dramatically altered both the use and content of criminal records in the state. The most visible reform, which is effective November 4, 2010 is popularly known as “Ban the Box.” The law removes the criminal history question from initial job application forms, ending the practice of upfront discrimination so that applicants can be considered for their skills and qualifications before divulging a criminal history. Massachusetts is only the second state in the country after Hawaii to apply the change to all private employers. A second central reform will reduce the waiting period to seal old convictions from public access. Felony convictions required a 15-year waiting period and misdemeanors required 10 years to seal. CORI reforms reduced those periods by 5 years, and also altered the waiting periods to commence at the beginning of any probation or parole instead of at the end. Lengthy time periods relegated former offenders to poverty and economic marginalization for decades after serving their debt to society. The third major reform upgrades the state’s CORI system to compete with for-profit, private background companies that sell criminal records online. Private background reports are notoriously inaccurate and can contain charges that resulted in a not guilty verdict or were dismissed. While the federal Fair Credit Reporting Act grants criminal records access to these companies, making CORI a more accessible online system drives employers to use the state’s better regulated, more restricted database. For most of the coalition’s grassroots leaders, the CORI campaign was their first exposure to the process of organizing and activism. Many of our leaders joined our organizations with no experience in politics and out of desperation in a struggle for survival. Close to six years later, our movement was victorious not only for winning landmark policies but also for bringing dozens of new activists into a broad-based grassroots movement. CORI reforms have been upheld as one of Massachusetts’ most significant policy victories secured by communities of color in the last decade. Though far from resolving the crisis of racialized unemployment in a post-Civil Rights economy, the ability for our state’s most marginalized residents to radically alter political discourse presents a blueprint for future organizing victories. While professional advocates and paid staff of organizations displayed incredible political acumen throughout the campaign, the fearless leaders who saw their own liberation tied to a collective struggle ultimately earned the historic victory.